We are getting ready for a mega monster storm here in New Jersey! Hurricane Sandy is heading up the East Coast and according to the news, it's going to mutate into a hybrid tropical-winter storm and attack us! It's pretty freaky and I hope that it's mostly hype. But you never know! I at least can look forward to a three-day weekend and I might just miss some of the chaos at work. At work, we have to worry about staffing the Studio and things like losing power, while our newspapers are dealing with the same things and trying to cover the preparations and aftermath. It can be pretty insane. I might be able to do some work from home. Keeping my fingers crossed! In the meantime, I plan to enjoy a crop, a Halloween party and a baby shower this weekend! Rochester's continuing series about schools. The numbers are pretty dramatic. 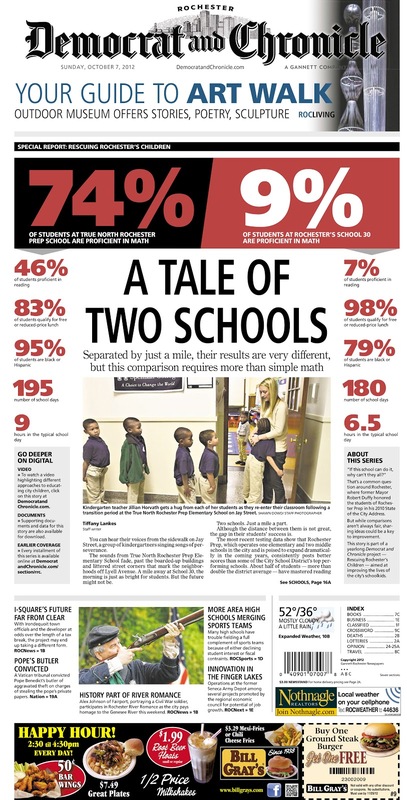 Those are the differences in math scores between a charter and public school. Ouch! I love working with my old friends at TJN again! And this was another fun skybox for Vineland promoting a special section.